Nice catch on the Virginian unit! BoxcabE50 and Kurt Moose like this. Speaking of Virginian.........how bout a lectric one? fordy744, Hardcoaler, Kez and 9 others like this. fordy744, Hardcoaler, BoxcabE50 and 6 others like this. A lone Goat Boat rests in downtown Minot while stormy skies build overhead, bad ordered for what looks like a bad headlamp. Caught one of the two waycars stationed in Golden for use on the Golden Local earlier in the week. The other side is covered in graffiti. fordy744, Hardcoaler, SP 9811 and 5 others like this. It is looking like it's derailed off of the track, or is it sitting on narrow gauge trackage?! It definitely looks like the leading wheel set is off rail. Same with the center set. Same deal with the rear truck. Dang, you guys don't miss a thing. Yeah, the rail on the opposite side rolled over a bit causing the gauge to widen. fordy744, badlandnp, Hardcoaler and 2 others like this. Oh well, a Virginian on the ground is still better than two in the bush... or something like that. I like the composition here! The skies and the angle really click. Kurt Moose, HemiAdda2d and Hardcoaler like this. badlandnp, Kez, fordy744 and 5 others like this. Yikes. This viewing angle is scary. It's amazing that rail didn't go all the way over. Enough friction from the spikes and the base of the rail/spike plates digging in, I guess. 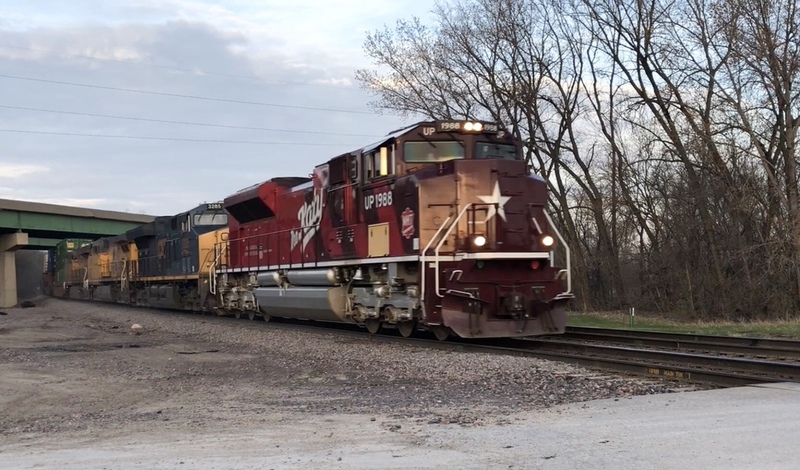 The Katy leads ZG2OA in Cedar Rapids, IA. badlandnp, Kez, fordy744 and 4 others like this. Is that access door on 1988 actually the wrong color? I think it is the reflection of the sun making it look like this. Moments after catching the 1988, UP 1995 comes by eastbound on a manifest. 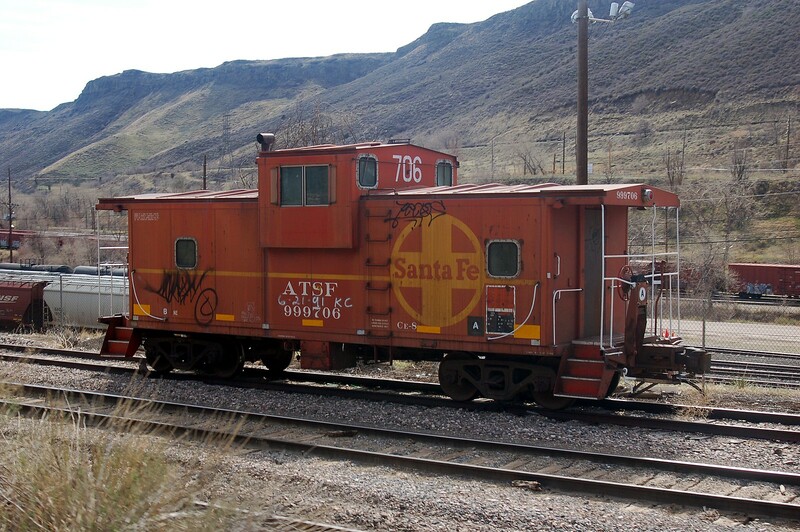 HemiAdda2d, badlandnp, BNSF FAN and 2 others like this. Wow, nice catch-two at the same time! 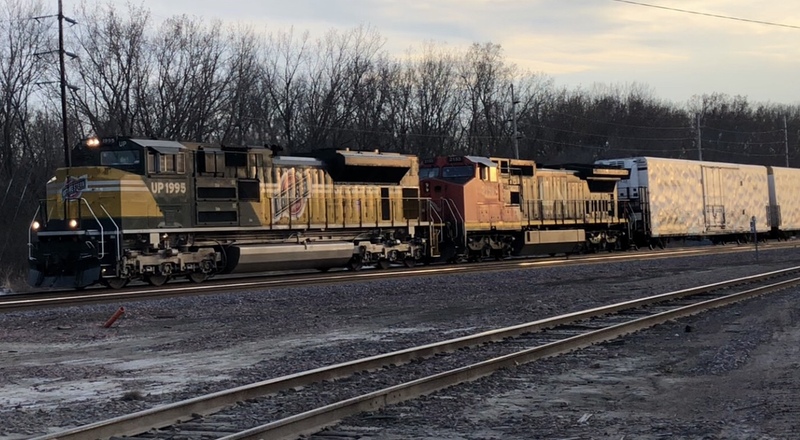 That CN unit, is that an old C40-8W?? That does look like a panel from another loco, right under the engineer side window? Possibly caused by lighting. The panel appears to be flat directly in line with the camera. If so, any light hitting the panel would be reflected to the camera at maximum intensity. My first thought was that it was caused by camera flash. There's also a slight reflection above the engineer's window.